Thank you for all of your work to ensure that the FY'19 budget strongly supports people experiencing homelessness and housing instability! There are many victories to celebrate, including increased funding to address youth and young adult homelessness; more funds to prevent homelessness among families with children as well as elders, youth, and people with disabilities; the elimination of the homelessness penalty in the Emergency Aid to the Elderly, Disabled, and Children program (EAEDC), and increased funds for the Massachusetts Rental Voucher Program (MRVP), to name just a few. The chart with our full list of priorities and outcomes is here. Please override the Governor's veto related to Emergency Assistance family shelter and services (EA, via the Department of Housing and Community Development administrative line item, 7004-0099). 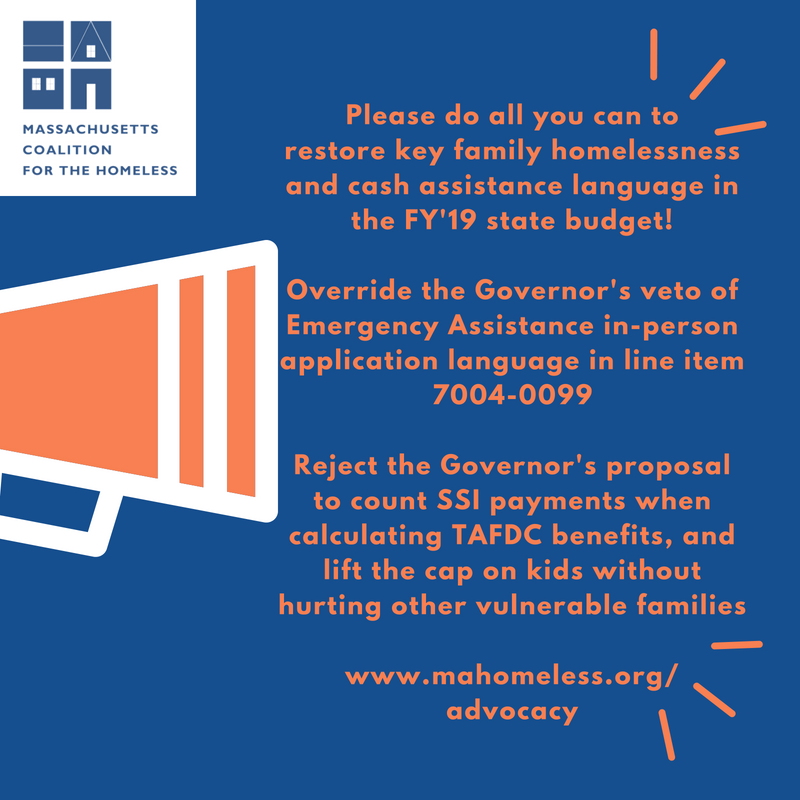 Please reject language changes to budget language that would lift the cap on kids in the Transitional Aid to Families with Dependent Children program (TAFDC, line item 4403-2000 and outside sections). Finally, please do all you can to pass Senate Bill 2568, An Act to provide identification to homeless youth and families. Our EA fact sheet is here . Please override this veto today. The Governor also vetoed language and issued outside section amendments related to lifting the family cap rule in TAFDC, trying to tie lifting the family cap with a terrible proposal to count the Supplemental Security Income (SSI) of adults with disabilities when calculating TAFDC benefits-- adults with disabilities so severe that they qualify for federal benefits. As with previous iterations of this proposal, this change would leave thousands of children and families without TAFDC assistance or with dramatically reduced grants. (See TAFDC veto text and outside section amendments .) Please reject these changes, and lift the cap on kids without harming families headed by a parent with disabilities. 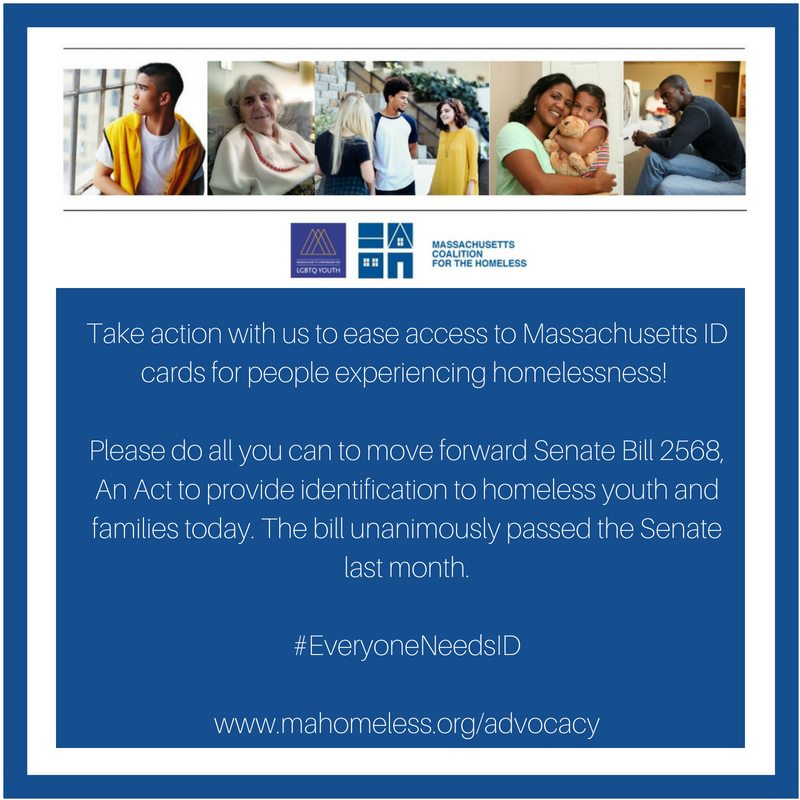 Senate Bill 2568, An Act to provide identification to homeless youth and families, calls on the Registry of Motor Vehicles to waive the $25 fee for Mass IDs for applicants who are experiencing homelessness, and to accept alternative verifications of Massachusetts residency from state agencies and social service agencies. Obtaining a state identification card is a critical first step for youth and adults experiencing homelessness to accomplish typical life tasks and access opportunities. ID is required for a broad range of life activities, such as applying for jobs, enrolling in education programs, getting a library card, picking up a package from the post office, opening financial accounts, entering certain government buildings (such as One Ashburton), accessing services, and interacting with law enforcement. Please take action before the session ends to make these commonsense, low-cost changes to RMV practices.